What do you do about leaks you can’t see? Well, the old fashioned solution is to take up floorboards and take out chunks of wall until you pinpoint the source. Thankfully, modern technologies have given leak detection specialists, like Cornerstone, many non-destructive ways of finding the source of a leak. Today we can often pinpoint the source of a leak and analyse the extent of the damage without so much as chipping the paintwork. In a few cases, we’ve managed to detect a leak without even entering the building. Below you’ll find a brief overview of some of the tools we use to work this magic. One way we record the information from our investigation is as a moisture map. This allows us to pull together information gathered by a wide range of tools and techniques into a single, clear, guide to the water problem in your home or business. Moisture mapping is often regarded as essential by insurance companies. There are 2 ways in which moisture mapping is used. The first is to create a physical, visible, trace of the edge of the water damage. This could be as simple as drawing on the wall with chalk or a marker once the edge of the wet zone has been determined using the tools below. This lets everyone involved quickly see if the wet zone is shrinking (i.e. the leak has been resolved and the area is drying out) or growing (clearly bad news). A second form of moisture mapping is to transfer this data to an alternative record source such as a paper drawing or computer model of the property. Using safe electrical pulses, these hand-held devices measure the amount of water in a surface. The result will usually be recorded as a percentage. Moisture meters are an easy, non-destructive option, so are a great first choice in many situations. When using a moisture meter, it is important to understand the scale that the individual moisture meter has, as these can vary, and also to recognise that most materials contain some moisture. This means that the ‘dry zone’ may register a low level of moisture on the meter. This is normal, and it’s why a professional will take measurements at various dry points in the property before working to establish the perimeter of the water damage. Special thermal cameras record the infrared light emitted by hot things and represent it on a screen as various colours. By adjusting the sensitivity, we’re able to quickly and easily detect many water leaks – both hot and cold – as they change the temperature of a particular area even when there are no obvious signs of damp. 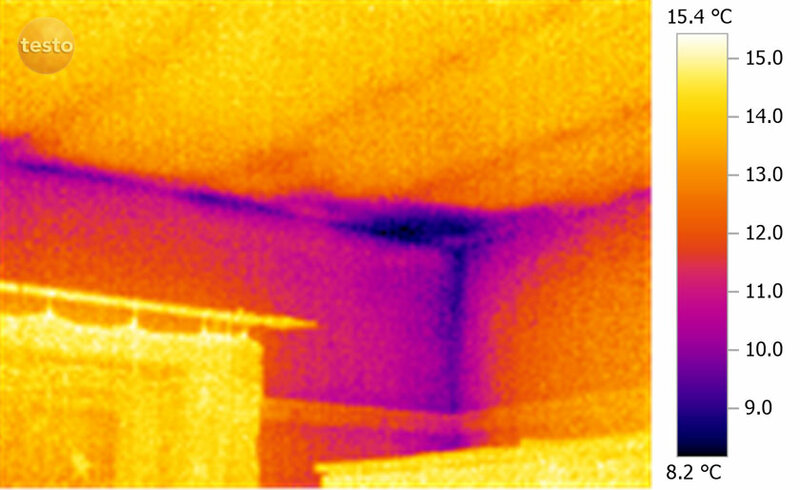 In some cases, thermal imaging cameras can also be used in voids and pipework. CCTV is just for capturing criminals. Closed-circuit television cameras can also be used to examine areas that humans can’t reach. If we can access a void or pipework through non-destructive or minimally intrusive means, we can often insert a small camera which allows us to make a much more detailed inspection of the space than a human would be able to. As an example, many properties have a loose floorboard as an access point for a stopcock or other underfloor element. By using this as an entry point for our cameras, we can study the underfloor area and pinpoint a leak. If you’ve ever tried to pump up a tire which has a large hole in it, you’ll recognise how a system pressurization test works. A system which – like that tire – has sprung a leak will be unable to maintain full pressurization. A loss in water pressure or a drop in the efficiency of a heating system can be the first sign that a leak is present. On complex systems, pressurising part of the system can be an effective way to narrow down where the leak is. Using a safe, food-grade gas and special detectors it can be possible to pinpoint the source of a leak in a heating system. This is particularly relevant for the larger and more complex heating systems used in industrial and commercial properties. If you notice a drop in pressure in your water-based heating system, a leak is a common reason. Tracer gas leak detection can find even slow or small leaks, helping stop a small problem before it becomes a large one. Like tracer gas leak analysis, dye testing involves introducing a foreign element into the system and seeing where it comes out. The tester introduces a water-soluble, non-toxic dye into the system and observes its progress. Dye testing can be used in a number of situations depending on need. It might be used to visually detect a leak (if part of your pipework goes bright red, you know you’re on a winner) and can also be used to detect a leak in a membrane or seal by making water currents visible. Analysing the content of water which has leaked out can help determine where the water has come from. As an example, if water contains a certain amount of chlorine, used to kill germs in drinking water, it’s probably fresh tap water. Used tap water and sewage will have other markers, while rain water leaking into a property will have a third set and groundwater a fourth. This method typically involves taking samples and sending them away for detailed analysis, so more immediate methods are often preferred. As with the wider chemical analysis, an on-site salt analysis measures the levels of various salts in the water system or ground at different points across the site. This is a popular and convenient way to detect earth salts in areas where they shouldn’t be present, such as wallpaper. Earth salts are a common indicator of rising damp. However, while the presence of salt is not sufficient to determine the origin of damp, it’s a clear sign that further investigation is needed.